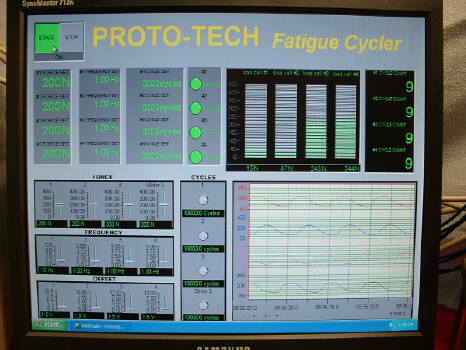 The Fatigue Tester by Proto-tech delivers reliable, multi-specimen fatigue cycling capability in an affordable package. 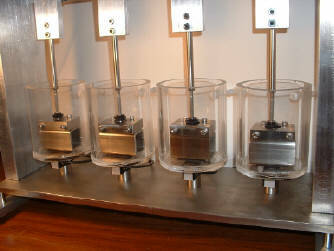 Proto-tech’s Fatigue Tester can simultaneously fatigue four specimens up to 400N. Using precision solenoids, the all-electric system offers millions of trouble-free cycles at a price far less than single-specimen hydraulic or mechanical systems cost. Closed loop control through individal in-line load cells ensures lifelong accuracy. And computer control through a PID module provides unmatched convenience and flexibility. 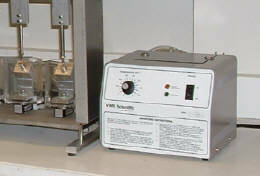 The Fatigue Tester features a load frame that accomodates a wide variety of test configurations. Designed with biomedical materials research in mind, the Fatigue Tester is also the ideal, high-throughput cycling station for a wide variety of test subjects: fasteners, adhesives, couplers, composites, assemblies, connectors, cements, structures or monolithic samples. Any test subject that is effected at the 400N level can be characterized by the Fatigue Cycler. 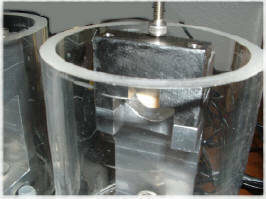 Fatigue testing can tie up a single-axis fatigue cycler for weeks. The four stations of the Fatigue Cycler can boost your throughput and accuracy. The Fatigue Cycler is priced considerably lower than a single axis hydraulic, pnuematic or mechanical fatigue machine. 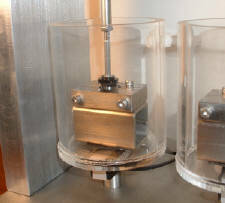 The Fatigue Tester platform can be used to perform a wide variety of tests. Proto-tech offers an assortment of testing fixtures to provide compression, flexure, shear and other loading scenarios. And the basic connector system allows custom fixtures to be applied as well. The individual specimens can be immersed in circulating, heated water using the optional specimen bath and heater system. An optional set of specimen-failure sensing switches allows the computer to monitor the specimen status and stop the cycling upon specimen breakage. Do you want to monitor the deflection of the subjects you are loading? Ask for the strain monitoring option on the Fatigue Tester. Individual LVDT position sensors are recorded at 12 bit resolution and 100Hz, while strain is displayed in real time. The Fatigue Tester by Proto-tech has been serving in labs across the U.S. since 2006, and now is available internationally and in a 220v version. The Fatigue Tester is individually crated and shipped to your location. It can be easily installed and operated by laboratory personnel using the included instruction manual. The instrument and all of its components are covered by a six months parts and labor warranty. The system consists of the computer, with monitor, the command and control module, and the test frame with four testing stations. Select the options to equip the system to meet your testing requirements. A purchase order is require to begin preparing your order, and a deposit of 50% is requested. Allow four to six weeks for delivery. Pricing: Please contact us to request a specifications sheet and pricelist, or to place an order. 2600 SE Swain Ave, Portland, OR 97267 U.S.A. Ph: 971-344-3730 email: info@fatiguetester.com. Also see Proto-tech’s complete line of dental biomaterials testing systems at www.prototechresearch.com.